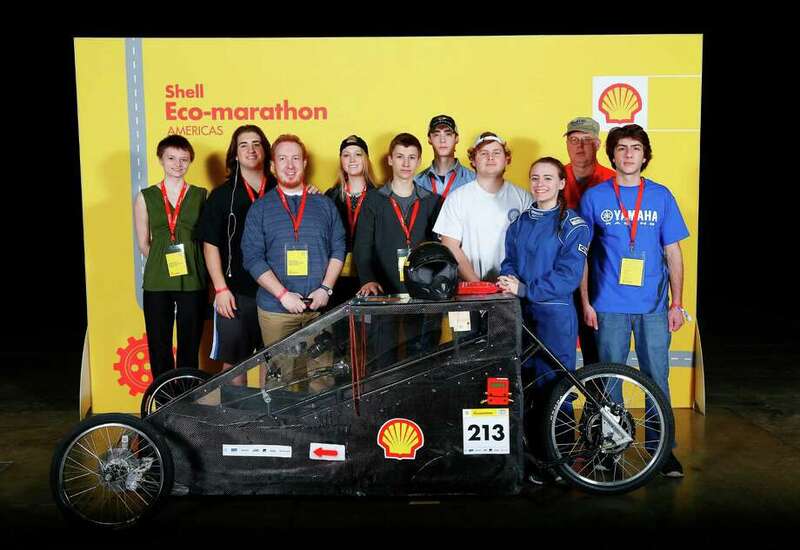 Last month, a dedicated team of Darien High School students travelled to the Motor City -- Detroit, Mich., -- for the Shell Eco-Marathon Americas 2015 competition. The annual contest pits more than 1,000 high school and college students against each other to see who can design the most fuel-efficient car. The Darien contingent's creation was a single-seat, three-wheel electric battery vehicle that they entered in the highly competitive and challenging Prototype Electric Battery category. The students designed and fashioned the vehicle from Lexan plexiglass, carbon fiber, circuiti boards, and other lightweight components . They came in 11th out of about 30 teams in their category, which was pretty good considering some of the challenges the team faced this school year -- which included a lack of funds and a broken fuel cell -- team members said. Members of the team talked about their experience last Friday at Darien High's sixth annual Energy Symposium, a school event to raise awareness about alternative energy. "It was a lot of work to figure out, but we worked really well together as a team," said 17-year-old C.J. Attisani, who helped build the car, which was powered by an electric motor. "You had to learn hands on by doing it," added Kim Hibben, a 16-year-old junior, who was also on the Darien team. Earlier in the school year, work on the project was limited to 45-minute bursts of activity in the team's Principles of Engineering class, the students said. The class is an elective that some students take repeatedly all through their high school career, with the students running most of the creative and problem-solving work themselves without faculty interference, the team members said. In the weeks before the contest, students worked longer hours trying to build and program the vehicle's motor controller, a group of linked circuit boards behind the driver's seat that provided control to the car's brakes, acceleration, and made sure steering worked properly, they said. "C.J. (Attisani) did a lot of the work on the circuit boards, but it was a group effort to try to get the most efficiency out of the car as we could for the contest," said Jack Thatcher, another student who worked on the technical side of the project. Even after a year designing and building the car and making their way to Detroit, the group worked 10-hour days to comply with various technical and safety requirements they needed to meet to avoid being disqualified, said Attisani, who envisions a potential career in automotive design and engineering. The work included having to find an improvised solution so the car's windshield was more tightly secured and also finding a way to properly separate the compartment holding the vehicle's motor controller from the driver compartment, a safety concern. Next year, the team plans to resume its effort to either design and build a fuel cell car or maybe create a more aerodynamic frame from carbon fiber, team member Charles Krigan said. "We didn't expect everything to be perfect when we got there," Krigan said. "Overall it went very well, especially the fact we made a carbon fiber shell with no experience dealing with large amounts of it is impressive."